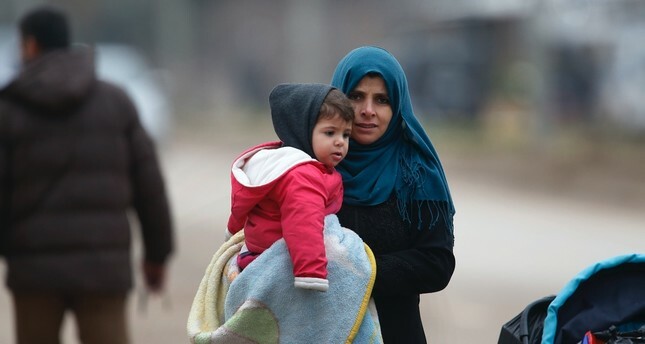 A Syrian woman holding a child walks towards Syria from Turkey at the Öncüpınar border crossing with Syria, Kilis, Turkey, Jan. 26. 2018. Neoliberal consensus has dissolved across Europe over the past 10 years. The expectation for a society composed of individual, unique identities that add to the whole, like a tomato or onion in a salad, rather than a melting pot of assimilation, has by now gone unfulfilled. Instead, the identities of various social groups are more like a platter of hors d'oeuvres — together, but different, and at the least not fighting with each other — which signals some level of success. With identity politics gradually losing ground and leaving in its place racism, xenophobia and anti-migrant sentiments across Europe, middle-class resentment and anger finds it easy to scapegoat migrants who they claim steal their social welfare. Coincidentally, Turkey's main opposition party, the Republican People's Party (CHP) has become the representative for nationalist, anti-refugee anger in Turkey by targeting Syrians. To be honest, this was not a part of the CHP's program during the first years of the civil war in Syria. The party's first reaction to the massive influx of refugees from Syria, from Turkey's southern border, was responsible and measured. It was surprisingly in line with the Justice and Development Party (AK Party) government's stance to provide Syrians with humanitarian assistance. For the November 2015 parliamentary elections, the CHP's election manifesto included some 40 detailed clauses about Syrian refugees in Turkey. This was also very close to the AK Party government's emergency plan, as well as its social and political concerns. It was a well-composed and carefully written 40-clause plan on the problems Syrian refugees may face in daily life, including funding their education and health care. It said they would not condemn Syrian refugees to be victims of their condition. The 2015 CHP election manifesto took on social issues such as housing and unfairly high rents for Syrians, and also vowed to protect them from labor exploitation in the job market. Disarming nonstate actors and supporting a peaceful political transformation that would represent Syrian people, as well as provide safe passage for refugees to return to their country was also a matter of utmost importance for the CHP in 2015. It also shared with the ruling AK Party a high level of awareness concerning border security and a strong proposal to drive all terrorist groups from the border, along with the creation of a safe zone. These statements, however, never grew into political discourse. We never heard the CHP voice them and only saw them on paper. In the following years, CHP Chairman Kemal Kılıçdaroğlu and other prominent figures in the party have adopted anti-refugee rhetoric, including calls to expel Syrians from the country, come what may. The CHP completely abandoned its like-mindedness with the AK Party regarding Syrian refugees during the parliamentary and presidential elections of 2018, limiting its manifesto to a small summary of the issue, with only seven clauses on general issues. It was a continuation, since 2016, of Kılıçdaroğlu and other top party officials' bigoted and xenophobic propaganda concerning Syrian refugees. In his speech at a rally in Giresun in 2017, Kılıçdaroğlu said: "There's no money for farmers, but do you know how much has been spent on Syrians? $30 million. They've become first-class citizens. The price of hazelnuts has made people in the Black Sea Region second-class citizens. You will ask for an account of this. It isn't me who will ask, but you. You don't reciprocate for the sweat on our brow, but you've spent $30 million on Syrians who don't work. I should think it is incumbent on those in the Black Sea provinces to ask for an account of this. Will you? Do you promise?" What Kılıçdaroğlu said was nothing more than an incitement of xenophobia and an effort to bring social tensions to boiling point. What are the reasons, though, for the CHP not taking a responsible and measured position on refugees in the platform of politics, instead building anti-Syrian rhetoric? The answer is hidden in both domestic and external factors that have pushed the CHP closer to nationalist middle-class anger. The CHP's base is mostly educated and middle class people in white-collar professions who live in cities the CHP is proud to run. It has clearly fallen under the effect of middle-class fragility concerning economic and social issues, obsessed with protecting their standard of living. The CHP voter base's understanding and perception of refugees as a threat also intersect with the typical anxiety over welfare felt by the middle class, almost to the same point where European xenophobia has found space to flourish. The CHP base has pushed and demanded that the party step back from policies that advise and produce projects for Syrians and instead has cheered on actions spurred by hatred. The culture of hate is another aspect of the privileged, middle class and white-collar electorate of the CHP. They hate those who are different from them – Kurds, actively religious people and women who wear headscarves – everyone outside their own identity group. Now, Syrians have simply been tacked onto their list.